Koyasan Bishop Emeritus Taisen Miyata performs the hatsu-goma ritual. In Japan, the customary New Year’s Day visit to a Buddhist temple or Shinto shrine to offer prayer and attend service is called “Hatsu-Moode.” As part of this observance, Koyasan Buddhist Temple will hold its annual “Hatsu-Goma” or first ritual of the new year on Thursday, Jan. 1, 2015 from 10 a.m. at the temple, located at 342 E. First St. in Little Tokyo. Bishop Emeritus Taisen Miyata will officiate the rite. 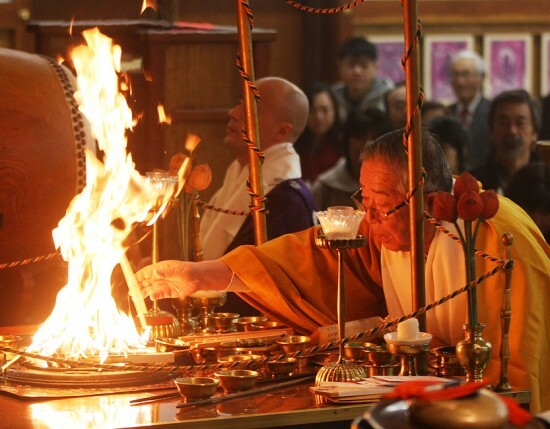 The fire ceremony begins with the chanting of mantras and beating of taiko drums and concludes with the distribution of mochi to those born in the coming Year of the Ram. Various omamori (amulets), omikuji (fortunes), hamaya (lucky arrows), ema (fortune plaques), and consecrated ofuda (paper talismans) will be available for visitors. In observance of the Year of the Ram（未), the temple will be open from 9 a.m. to 5 p.m. for three days, Jan. 1 to 3, during which more than 3,000 people are expected to visit. For further information, call (213) 624-1267.